Dancing with confidence comes from truly loving what you’re doing in that moment. If you genuinely love what you’re doing, everyone else around you will love it too. That’s what confidence on the dance floor looks like. It took me a long time to realize this. I used to think, “If I just learn that movement…” or If I just win that competition…” then voila!, that’s when I’ll finally feel confident on the dance floor. I believed that after I had checked off a defined list of accomplishments, I’d finally be good enough to dance with the type of confidence I admired in others. But that voila! moment I was waiting for never came. I learned that movement and I won that competition, but confidence didn’t magically materialize after I’d hit those goals. This seemingly paradoxical situation frustrated me. It angered and drained me too, and for a while I wondered if maybe I had just fallen out of love with dance. I hadn’t. If anything, I was more in love with dance than ever. But instead of sinking into that love and letting it saturate me, I was waiting for someone (or something) to give myself permission to let myself love my own dancing. In the last year I’ve learned that I’ll always be learning. As a dancer, there will always be new movements to master, new turn patterns to learn, new muscles to strengthen. As an artist, I will always strive to create something more beautiful, more raw, more moving. There is always something to improve, always a new goal to reach. Dance is a journey after all, and that journey changes every single day. Sometimes it goes sideways and diagonally and backwards too. But that doesn’t mean I can’t absolutely love what I’m doing in the moment, at that part of my journey. You don’t have to be an advanced dancer to dance with confidence. You don’t have to know a certain number of turn patterns, or series of steps. You don’t have to win a certain competition. You don’t have to dance like anyone other than yourself. You just have to give yourself permission to love your own dancing. So next time you’re out social dancing, look around you. Notice the people in the room having a blast on the dance floor. Watch them for a while and remember that no one in that room is stopping you from being one of them, except you. From experience, I know this change doesn’t happen overnight (or after reading one article), so here are five practices to help you learn to love my own movement in the moment. Do you have any others? I’d love to hear them in the comments below! The more you practice any skill set, the more comfortable you’ll feel using it in the moment. Dance is no different. 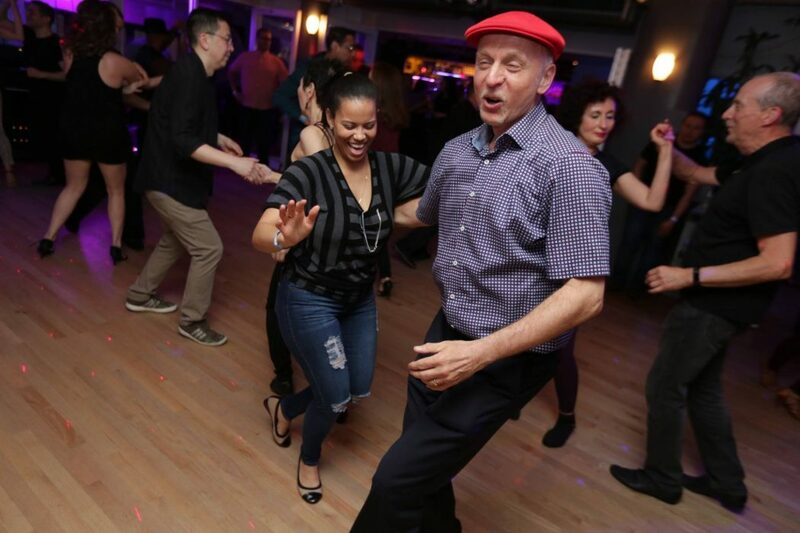 The more you practice different movements and steps on your own in an environment where you feel no judgment (like a quiet studio space or your living room), the more comfortable you’ll feel when it’s time to use all of elements social dancing. When you’re thinking about how much time to spend practicing, keep in mind that your body takes much longer to absorb new information than your brain does. So even if you think you’ve nailed something, chances are your body could benefit from going over it a few more times. Think of a recent “win” outside of dance. Maybe you nailed a presentation earlier this week at work, or are in a new and exciting romantic relationship. Perhaps you woke up 15 minutes earlier this week and made it to work early. Little wins count just as much as those big wins, and every single positive vibe influences the level of confidence you bring into your dancing, even if you don’t realize it. Next time you feel a negative thought coming on, counteract it by focusing on something in your life that’s going really well right now. Remind yourself how far you’ve come. It sounds so simple, but this reminder can do wonders when you take time to reflect on it for a few minutes. You are a better, stronger dancer today than you were yesterday, two weeks ago, two months ago, and certainly two years ago! You can even pull up old videos to see how far you’ve come, literally. Remember too that even the absolute best dancer in your social scene, started from the same place you did––with no experience and no ability. No one walks out of the womb a great dancer. We all start from the same place, and at any given time we’re all in different parts of our dance journey. If you really need a reminder about how far you’ve come, drop in to an absolute beginner dance class where the instructor is breaking down the basic step. Seeing other people struggle with something you’ve now mastered is sure to boost your confidence and help you remember how much progress you’ve made. When you put all of your energy into listening to the different sounds and rhythms of the song, it’s really hard to think about anything else! As human beings, we don’t have enough mental energy to really focus on more than one thing at a time. Our brains don’t work that way. Next time you’re in the middle of a dance and just can’t seem to get those negative thoughts out of your head, listen for the sound of a specific instrument. Focus all of your attention on how you can match your movement to a particular rhythm. You’ll find that when you put ALL of your energy into the actual movement you’re trying to create, you’ll be so absented in what you’re doing that you won’t even have time to worrying about what people around you might be thinking. ** Performers and competitors, this is a great tip for you too! It’s much harder to be nervous during a show if you put all of your effort into listening and then moving to the song you’re dancing to. Focusing on the music can also help get into your piece when you walk on stage and into a lifeless crowd. While self-reflection is super helpful (I’m a huge fan of journaling! ), opening up to someone about how you’re feeling will show you that you’re not alone. Everyone has felt insecure about their dancing and struggled with confidence at one time or another, even world champions. Hearing someone’s else’s story can help you own your own (that’s one of the reasons I wanted to share mine here!). Talk to a dance friend, or better yet, a coach, like Anya Katsevman, who’s trained hundreds of dancers on and off the stage, and has heard it all. An expert can help you dig into the root cause of your feelings and support you as you work through them. Dancers like Katsevman, Melany Mercedes, and Isabel Freiberger are opening up the conversation about real issues on IG too, so if you don’t already follow them, add them and join the conversation! I have liked every article you have written but i particularly liked this one. So true, so on point because i have experienced it less than 6 months ago. I remembered how powerless i was feeling and how desperate i was when i thought that i didn’t want to dance anymore. Your advices are good ones. I also reminded myself that i was doing it for me and no one else. And that’s what gave me the confidence to go back on the dance floor. 1) Practice – nothing instills doubt faster than a lack of practice, and it’s quite the opposite when you put in the time. 3) Remember how far you’ve come – I don’t know why it’s so hard to turn off the “I have to be better than this” voice, but it truly is and it’s so easy to forget to be grateful for the progress you’ve made so far. It definitely brings up all the warm fuzzies gives a healthy dose of perspective. 4) Focus on the music – just yes. 5) Talk it out – we could all do more of this so THANK YOU for writing this and sharing your voice and experience, and reminding me of all the things I need to hear. Thank you for reading and taking the time to comment Robin!!! I’m so glad it was what you needed to hear 🙂 haha, I needed to hear them too, especially when I first sat down to write this pice. And re: #2 — YES! every single aspect of our lives is so interconnected, and definitely affects our dancing and vice versa, even when we don’t think it is!